One of the more idealistic goals of Solarnetics and its research is education. All of the research at Parowan Gap and the other petroglyphic sites is to preserve and teach modern peoples of the importance and significance of these sites. As artifact of ancient peoples these petroglyphic sites are the only voice that yet speaks to us of their feelings and impressions of their world. What we have is not a lot and we have no Rossetta Stone to make their message clear. The science of archaeoastronomy is one of the few windows that give some insight into what some of the inscriptions indicate. Therefore not all inscriptions are decipherable. However where we can find meaningful and well connected astronomical date alignments and corresponding numbers that fit into the event alignments, we can procede to a first level of meaning for that glyph and maybe even to meaning to a family of such glyphs. Prof. Nal Morris teaches astronomy and archaeoastronomy at UVSC (Utah Valley State College). The class on archaeoastronomy teaches many different subjects in addition to classical astronomy. 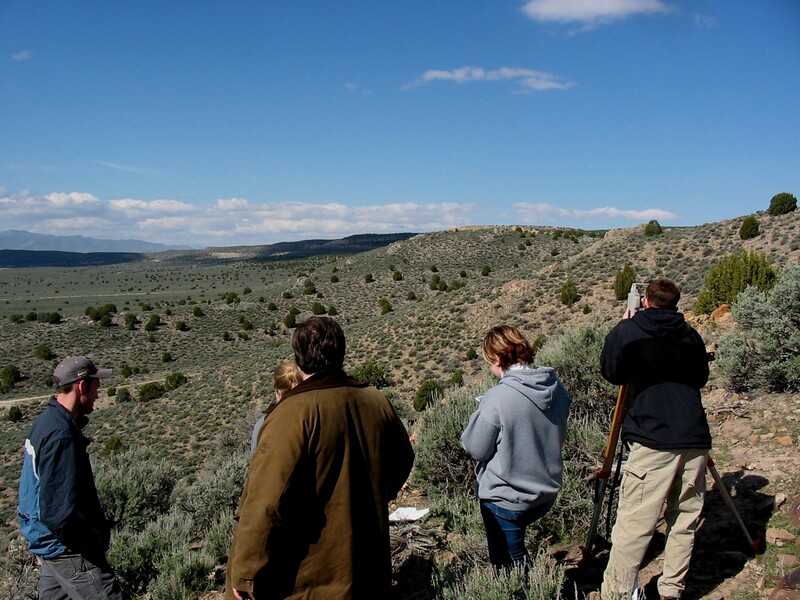 In the picture above, students are surveying the western horizon at a petroglyphic site near Utah Lake. They are using the transit and the companion survey field techiques of SHAMOS. In their course of study they are learning in addition: history, ancient astronomy, some archaeology, the evolution epistemology, ethnography and more. Prof. Morris is willing to give lectures on archaeoastronomy in community settings. Solarnetics believes that showing the world that these sites were created by intelligent and insightfull people will help to preserve and protect in the long run the sites from being destroyed.